Some days you wake up and all you want to do is get back into bed. I had one of those this morning. I had a long to do list for today but then a flat tire caused all my well laid plans to go out the window. It is mornings like this when you need a little more convincing that it is still worthwhile to be up. Cue the pear dutch baby pancake. How could that golden puffy top not bring a smile to your face? And the pears? They are nestled under that blanket of soft puffiness. 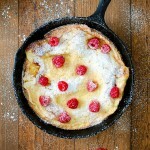 Dutch baby pancakes are what happens when you cross a pancake and a popover. Like popovers, dutch baby pancakes will deflate very quickly. So be sure to call your diners to the table before you pull the pan from the oven. That way everyone will get to enjoy the pancake when it is still light and airy. Thanks to this pancake and my sister (who always has my back) helping me with the flat tire, my day is back on track. Melt butter in a 9-inch cast iron skillet over low heat. Measure out about 1 tablespoon of the melted butter into a medium bowl. Add eggs to butter in bowl and beat together. Add milk and flour to egg mixture; mix well. To the skillet, add sliced pears and sauté briefly in butter. Drizzle pears with lemon and sprinkle with confectioner’s sugar. Sauté 30 seconds more. Arrange pears in single layer in pan. Pour egg mixture over the pears. Transfer skillet to the oven and bake 20-25 minutes or until pancake is puffy and golden brown. Top with berries, if using and dust with confectioner’s sugar. Cut into quarters and serve immediately. Recipe from the Breakfast in Bed cookbook. So I need to yell for everyone to sit down before I finish making it so they are on standby to eat as soon as it comes out of the oven? I’m good at that. I already do it for pasta 🙂 Love this! Never tried it – which means I need to! Dutch baby pancakes are so much fun. You never quite know how they will come out when they rise but they’re always tasty. Hope you get to try this soon.